I have been using audio plugins for a long time. I have always wanted to design and program them. This page is dedicated to all the plugins I have programmed so far. I would like to thank Steinberg Media Technologies for providing me with their VST SDK for me to continue experimentation with various projects of mine. For some of these plugins, I have utilized the powerful Audio API by RtAudio and the C++ WDL Library by Cockos Incorporated. For others, I have used Objective C and CoreAudio. I will be providing download links to these plugins. You would require VST compatible DAWs to run these plugins. Else, you can test the plugin out as a Windows Standalone. Contact me on my contact page if you come across any issue or want to give me feedback. If at all you utilized these plugins to make something awesome, I would love to give it a listen! So feel free to send me your creations! I will also embed/place them on this page if at all you do so. Spectral-EQ is a plugin developed for Logic Pro. It is a spectrum analyzer with a 6 band parametric equalizer. It graphs out both the pre as well as the post-processed signal. This plugin was written using a combination of Objective C and C++ and utilizes the accelerate framework to compute the FFT. Pedal Stack is a guitar processor app built for macOS. This app was written in a combination of Objective C and C++. There are 5 usable guitar pedals: Delay, Distorition, Reverb, Whammy and Equalizer. Each pedal has a corresponding set of tweakable parameters. 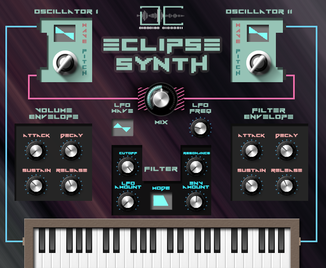 Eclipse Synth is a Virtual Analogue Synthesizer Instrument which has 2 Oscillators and manual control over various parameters such as the Volume Envelope, Filter Envelope and three different types of Filters. This plugin is available for Windows as a Standalone executable as well as both 32 and 64 bit VST2 and VST3 formats. 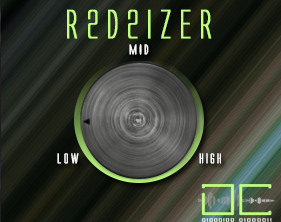 R2D2IZER is named after the iconic robot, R2-D2. This plugin is a one knob oscillator which generates digital tones sounding similar to that of R2-D2’s voice. This plugin is available for Windows as a Standalone executable as well as both 32 and 64 bit VST2 and VST3 formats.